DC Comics Harley Quinn - Coaster Pack (4 Coasters).. Suicide Squad - Bomb Gift Set.. Suicide Squad - Coaster Pack (4 Coasters)..
Own DC Comics - Bombshells Harley Quinn Red Mug from Deff, DVD, Blu-Ray & 4K Video Specialists - Free UK Delivery..
Own DC Comics - Harley Quinn Be Yourself Mug from Deff, DVD, Blu-Ray & 4K Video Specialists - Free UK Delivery..
Own DC Comics - Harley Quinn Bombshells Collector Print 30 x 40 from Deff, DVD, Blu-Ray & 4K Video Specialists - Free UK Delivery..
Own DC Comics - Harley Quinn Bombshells Mug from Deff, DVD, Blu-Ray & 4K Video Specialists - Free UK Delivery..
Own DC Comics - Harley Quinn Hammer Framed Print 30 x 40 from Deff, DVD, Blu-Ray & 4K Video Specialists - Free UK Delivery..
Own DC Comics - Harley Quinn Mug Gift Set from Deff, DVD, Blu-Ray & 4K Video Specialists - Free UK Delivery..
Own Harley Quinn - Harley Quinn Hammer Framed Print 30 x 40 from Deff, DVD, Blu-Ray & 4K Video Specialists - Free UK Delivery..
Own Harley Quinn - Hello Puddin Doormat from Deff, DVD, Blu-Ray & 4K Video Specialists - Free UK Delivery..
Own Suicide Squad - Bad Girl Mug from Deff, DVD, Blu-Ray & 4K Video Specialists - Free UK Delivery..
Own Suicide Squad - Bomb Mug from Deff, DVD, Blu-Ray & 4K Video Specialists - Free UK Delivery..
Own Suicide Squad - Compilation Mug from Deff, DVD, Blu-Ray & 4K Video Specialists - Free UK Delivery..
Own Suicide Squad - Cracked Mug from Deff, DVD, Blu-Ray & 4K Video Specialists - Free UK Delivery..
Own Suicide Squad - Daddys Lil Monster Mug from Deff, DVD, Blu-Ray & 4K Video Specialists - Free UK Delivery..
Own Suicide Squad - Deadshot Crazy Mug from Deff, DVD, Blu-Ray & 4K Video Specialists - Free UK Delivery.. Suicide Squad Extended Cut Special Features Special Features May Not Be In High Definition. Audio & Subtitles May Vary. Task Force X: One Team, One Mission - Discover The Rich Legacy Of DC's Most Infamous Bad Guys, Squad Strength And Skills - How'd They Whip Themselves Into Shape?, Get The Inside Story, Joker & Harley: The 'It' Couple Of The Underworld - She's Rotten. He's Damaged, They're A Match Made In Hell, Chasing The Real - Write..
Own Suicide Squad - Good Night Mug from Deff, DVD, Blu-Ray & 4K Video Specialists - Free UK Delivery..
Own Suicide Squad - Group Mug from Deff, DVD, Blu-Ray & 4K Video Specialists - Free UK Delivery..
Own Suicide Squad - Group Orange Flame Framed Print 30 x 40 from Deff, DVD, Blu-Ray & 4K Video Specialists - Free UK Delivery..
Own Suicide Squad - Harley Bat Mug from Deff, DVD, Blu-Ray & 4K Video Specialists - Free UK Delivery..
Own Suicide Squad - Harley Quinn Crazy Mug from Deff, DVD, Blu-Ray & 4K Video Specialists - Free UK Delivery..
Own Suicide Squad - Harley Quinn Good Night Mug from Deff, DVD, Blu-Ray & 4K Video Specialists - Free UK Delivery..
Own Suicide Squad - Harley Quinn Monster Framed Print 30 x 40 from Deff, DVD, Blu-Ray & 4K Video Specialists - Free UK Delivery..
Own Suicide Squad - Harley Quinn Mug from Deff, DVD, Blu-Ray & 4K Video Specialists - Free UK Delivery..
Own Suicide Squad - Harley Quinn Stand Framed Print 30 x 40 from Deff, DVD, Blu-Ray & 4K Video Specialists - Free UK Delivery..
Own Suicide Squad - Harley Quinn Stand Framed Print 30 x 75 from Deff, DVD, Blu-Ray & 4K Video Specialists - Free UK Delivery..
Own Suicide Squad - Harley Quinn Tattoo Parlour Mug from Deff, DVD, Blu-Ray & 4K Video Specialists - Free UK Delivery..
Own Suicide Squad - Harley Wink Mug from Deff, DVD, Blu-Ray & 4K Video Specialists - Free UK Delivery..
It’s batter up at Belle Reve, and that can only mean that Amanda Waller, the penitentiary’s cold and calculating warden, has a mission only the damned will take on. It’s time to unleash Task Force X again, stacked with seasoned vets such as Deadshot, Captain Boomerang and Harley Quinn. These crafty criminals are joined by newcomers Copperhead and the martial arts master, Bronze Tiger! 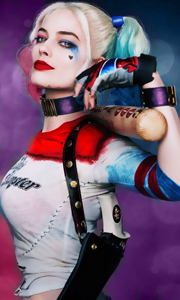 With the target being a mystical object so powerful ..
Own Suicide Squad - I’ve Been A Very Bad Girl Mug from Deff, DVD, Blu-Ray & 4K Video Specialists - Free UK Delivery..
Own Suicide Squad - Joker And Harley Framed Print 30 x 40 from Deff, DVD, Blu-Ray & 4K Video Specialists - Free UK Delivery..
Own Suicide Squad - Joker Crazy Mug from Deff, DVD, Blu-Ray & 4K Video Specialists - Free UK Delivery..
Own Suicide Squad - Joker Mug from Deff, DVD, Blu-Ray & 4K Video Specialists - Free UK Delivery..
Own Suicide Squad - Logo Mug from Deff, DVD, Blu-Ray & 4K Video Specialists - Free UK Delivery..
Own Suicide Squad - Playing Card Mug from Deff, DVD, Blu-Ray & 4K Video Specialists - Free UK Delivery..
Own Suicide Squad - Rotten Tattoo Mug from Deff, DVD, Blu-Ray & 4K Video Specialists - Free UK Delivery..
Own Suicide Squad - Skulls Framed Print 30 x 40 from Deff, DVD, Blu-Ray & 4K Video Specialists - Free UK Delivery..
Own Suicide Squad - Skulls Mug from Deff, DVD, Blu-Ray & 4K Video Specialists - Free UK Delivery..
A team of the world's most dangerous incarcerated super villains, with the most powerful arsenal at the governmnet's disposal, is sent off on a mission to defeat an enigmatic, invincible entity. Special Features Explosive Extras (Only Available In 2D): Task Force X: One Team, One Mission, Discover The Rich Legacy Of DC's Most Infamous Bad Guys, X Squad Strength And Skills, How'd They Whip Themselves Into Shape? Get The Inside Story, X .. It feels good to be bad… A team of the world’s most dangerous, incarcerated Super Villains, provide them with the most powerful arsenal at the government’s disposal, is sent off on a mission to defeat an enigmatic, invincible entity. Special Features Special Features May Not Be In High Definition. Audio And Subtitles May Vary Blast Open The Secrets Behind The Worst. Heroes. Ever. Explosive Extras: Task Force X: One Team, One Mission - .. It feels good to be bad… A team of the world’s most dangerous, incarcerated Super Villains, provide them with the most powerful arsenal at the government’s disposal, is sent off on a mission to defeat an enigmatic, invincible entity. Special Features Gag Reel..
Own DC Originals - Harley Quinn Mug from Deff, DVD, Blu-Ray & 4K Video Specialists - Free UK Delivery..
Own Harley Quinn - Heroes & Villains Range DVD from Deff, DVD, Blu-Ray & 4K Video Specialists - Free UK Delivery..
Own Suicide Squad - Crazy Love Mug from Deff, DVD, Blu-Ray & 4K Video Specialists - Free UK Delivery..
Own Suicide Squad - Harley Quinn Skull Mug from Deff, DVD, Blu-Ray & 4K Video Specialists - Free UK Delivery..
Own Suicide Squad - Harley Wave Mug from Deff, DVD, Blu-Ray & 4K Video Specialists - Free UK Delivery..
Own Suicide Squad - Slipknot Skull Mug from Deff, DVD, Blu-Ray & 4K Video Specialists - Free UK Delivery..
Own Suicide Squad - The Joke's On You Mug from Deff, DVD, Blu-Ray & 4K Video Specialists - Free UK Delivery..
Own Suicide Squad - The Joker Mug from Deff, DVD, Blu-Ray & 4K Video Specialists - Free UK Delivery..
Own Suicide Squad - Watch Them Burn Mug from Deff, DVD, Blu-Ray & 4K Video Specialists - Free UK Delivery..